Willa Cather with Mount Monadnock in the background. Willa Cather’s name is more likely to bring to mind the swaying wheat of the Nebraska plains than, say, the ragged, rocky rise of New Hampshire mountains. 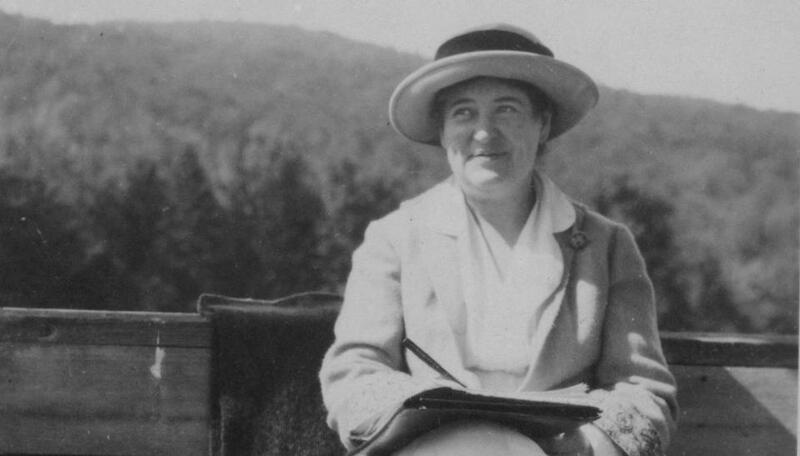 But Jaffrey, N.H., near the base of Mount Monadnock, is where Cather spent her summers and falls between 1917 and 1940, and where she wrote “the best part of all the better books,” according to a letter she penned to her brother. She’s buried there behind the 1775 Meetinghouse. And this weekend, Jaffrey hosts a two-day celebration of the 100th anniversary of Cather’s classic “My Ántonia.” The Willa Cather’s Spirit Lives On! festivities open on Friday evening with a reception, followed by guided gravesite tours, a visit to the Melville Academy Museum, and on to the field where Cather pitched a tent and wrote parts of “My Ántonia’’ and “One of Ours.” Actors from Project Shakespeare will perform, pianist Virginia Eskin will play some of Cather’s favorite music, and there will be a performance of Will Ögmundson and Tom Dunn’s musical, “Kindness and Cruelty: Willa Cather in Jaffrey.” Tickets are $75 and more information can be found at jaffreychamber.com. “I am doing my best not to become a museum/ of myself,” writes poet Natalie Diaz in her poem “American Arithmetic.” It’s one of the pieces being featured as part of the Native American Poets Playlist at the Peabody Museum of Archaeology & Ethnology at Harvard. Now through Nov. 30, museum visitors can listen to a selection of audio files of poems from the new anthology “New Poets of Native Nations” (Graywolf) using headphones as they explore the galleries that hold the exhibitions of native arts and culture. The playlist also features work from Tommy Pico, Gwen Nell Westerman, dg nanouk okpik, Trevino L. Brings Plenty, Eric Gansworth, Margaret Noodin, and Tacey M. Atsitty, who writes in “Anasazi,” “We’ve practiced dying/ for a long time: when we skip dance or town,/ when we chew.” Use of audio players is free with museum admission, and more information can be found at peabody.harvard.edu/native-american-poets-playlist. True stories take center stage at a new reading series that launches this week in Cambridge. Tell-All Boston, a quarterly literary performance series co-sponsored by Grub Street and curated by the writing organization’s Memoir Incubator program, will bring known and emerging writers alike to the Middlesex Lounge in Central Square to read their first-person pieces. Joan Wickersham, author of “The Suicide Index: Putting My Father’s Death in Order” (Houghton Mifflin Harcourt), headlines the launch event Oct. 18, reading alongside Deborah Schifter, Norman Belanger, Angie Chatman, and Beya Jimenez. Submission guidelines and more information can be found at tellallboston.com. The debut show will begin at 6:30 p.m. at the Middlesex Lounge, 315 Mass Ave. in Cambridge.